We offer these additional exciting MIDI Add-ons to help you get the most out of Band-in-a-Box®! Master Swingin' Jazz Piano Solos & Comping, Duets for Band-in-a-Box®, CopyMe and 50 Novelty Piano Riffs are included in the EverythingPAK and Audiophile Editions of Band-in-a-Box®. The Master Solos Series are solos played by a professional studio musicians, with accompanying piano(comping), bass, drums, and strings. The Master Solos Series are stand-alone programs, with the exception of The Master Swingin' Jazz Piano Solos and Comping. As an additional bonus, the stand-alone programs include the songs in Band-in-a-Box® format, free! The complete Master Solos Series is included in the EverythingPAK and Audiophile Editions of Band-in-a-Box®, and the Songs & Lessons PAK. Join Master Jazz Pianist Miles Black in this Band-in-a-Box® add-on featuring 50 great Jazz piano improvisations over typical chord changes. Using this add-on, you can easily learn soloing and comping techniques for swingin' Jazz piano. Songs include trio arrangements with bass and drums in Band-in-a-Box® format. Follow along with the on-screen notation or open the Big Piano Window to see exactly how the solos are played. Step through the tunes, chord by chord or note by note, or slow down the tempo to learn the solos at your own pace. Instantly transpose the tunes to learn them in all 12 keys, or print the music with chord symbols and notation for further study. What a great and fun way to learn swingin' Jazz piano soloing! This program is a stand-alone program that is an interactive learning aid, designed to help you learn to solo like a professional jazz guitarist. Musicians studying improvisation typically learn by copying other soloists' performances. Since guitar is a "visual instrument," it is easier to learn to play by watching the fretboard than by reading the music from a staff. The on-screen guitar fretboard shows you exactly which notes and chords are being played on the guitar. There are guide notes for typical positions for the key, and note names, to help you learn the fret/string positions. The purpose of this program is to help you to learn the art of jazz improvisation. The student who wants to lean to improvise jazz music is usually told to listen to some jazz solos, and learn from them. Learn how to solo like a master! All of the solos are integrated with an on-screen piano display and notation, allowing you to see and hear note-for-note exactly what is being played. Advanced features allow you to loop any portion of a solo, to slow a solo down, or step through a solo one note at a time. You can also print the solos out for further study. All the right hand solos in this program were played by Miles Black, accompanied by Band-in-a-Box® on the left hand piano. 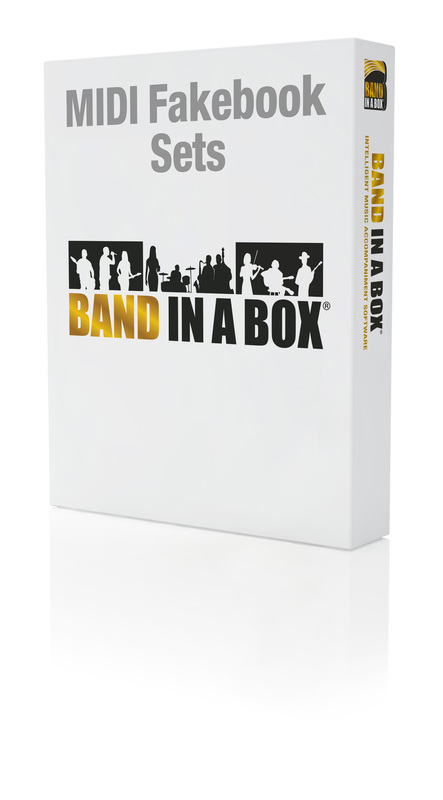 You can use the Band-in-a-Box® program to generate your own blues tunes, while you play the solos! All tunes are done in standard MIDI and Band-in-a-Box® MGU formats with either solo piano or a complete band arrangement (drums, bass, guitar and piano soloing). This program can also be used as a stand-alone program. This program is a stand-alone program that is an interactive learning aid, designed to help you learn to solo like a professional flatpick guitarist. Musicians studying improvisation typically learn by copying other soloists' performances. Since guitar is a "visual instrument," it is easier to learn to play by watching the fretboard than by reading the music from a staff. The on-screen guitar fretboard shows you exactly which notes and chords are being played on the guitar. There are guide notes for typical positions for the key, and note names, to help you learn the fret/string positions. The purpose of this program is to help you to learn the art of flatpick improvisation. The student who wants to learn to improvise flatpick music is usually told to listen to some flatpick solos, and learn from them. The MIDI Fakebooks give you hundreds of songs at the touch of a button. Load the songs into Band-in-a-Box® for practicing, playing along, or creating your own arrangements right on your computer. 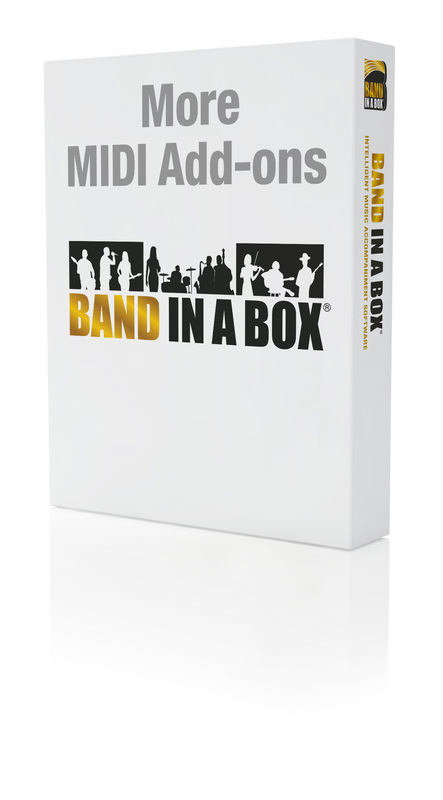 All of the MIDI Fakebook Sets are included in the EverythingPAK and Audiophile Editions of Band-in-a-Box®, and the Songs & Lessons PAK. The sound track music styles in Styles Set 50 are a kind of blank mood canvas, ready to create music tracks for your home videos, corporate presentations, movies, voice-overs, or jingles. The SoundTracks MIDI Fakebook Volume 2 uses these styles for even more royalty-free songs that are Joyful, Reflective, Exotic, Goofy, Funky, Upbeat, Mysterious and Majestic &dash; just to name a few. These songs are ready to go "as is," or as templates for your own sound track compositions. And the award goes to? You! Picking up where Volume 2 left off, The Classical MIDI Fakebook Volume 3 includes 100 well-known Classical standards performed by Miles Black. The influence of Classical music is undeniable and still reverberates in today's popular music. What better way to study the works of the great masters than seeing and hearing them performed in Band-in-a-Box®'s "chords & melody" format. Whether you are a casual listener or a serious music student, The Classical MIDI Fakebook Volume 3 has something for everyone. 100 performances of well-known Classical standards performed in Band-in-a-Box® "chords and melody" format. Hear the great works of Chopin, Beethoven, Mozart, and many others in virtuoso melodic performances by Miles Black. See and learn how the great masters used similar chord progressions to those employed today. Change the styles for variations, learn the pieces by studying the chords, or transpose the pieces to familiar keys for further study. The MIDI Fakebook gives you hundreds of your favorite tunes at the touch of a button. Load the songs into Band-in-a-Box® and play along, or create your own arrangements. Learn traditional Jazz and improve your improvisational skills at the same time with the Soloist Feature in Band-in-a-Box®! Includes 300 songs: Traditional / Original Jazz and Pop - 50 Songs. Classical - 200 Songs. Bluegrass - 50 Songs. Duets for Band-in-a-Box®, CopyMe and 50 Novelty Piano Riffs are included in the EverythingPAK and Audiophile Editions of Band-in-a-Box®. Have you ever noticed how much easier and fun it is practicing along with another musician? Whether you're working on your sight-reading, or learning a new piece of music, you can often make a lot more progress when someone else is practicing with you. Duets for Band-in-a-Box® will provide any user with a more inspiring way to practice! This is an exciting series of 50 Duets, each designed specifically by Miles Black for sight-reading practice. Both parts have an independent contrapuntal melody, so you feel like you have a real playing partner at your side. Each of the 5 genres, Classical, Jazz, Smooth Jazz, Bebop and Rock, includes 10 great contrapuntal melodies. With one melody line recorded on the Melody track and the second on the Soloist track, it's easy to see and hear what each part is playing. Mute one melody and play along with the other, then reverse the roles and sight-read the other part. Don't forget to set the "Scroll-ahead" to the desired setting so you will have an automatic page turner. Also included is a folder with the 50 Duets transposed into all 12 keys. This is a fantastic way to improve your sight-reading! CopyMe is an exciting teaching concept for Band-in-a-Box®. Here's how it works: your piano teacher, Miles Black, plays a 2-bar piano phrase along with a Band-in-a-Box® accompaniment. That 2-bar piano phrase is then followed by 2 bars of the same Band-in-a-Box® accompaniment with the piano part silent. This is where you come in... just copy what Miles has played. Once the lesson is complete, Miles explains and plays the next concept, followed again by your turn to play. With the synchronized audio track you will hear Miles explain and encourage you as each lesson progresses. The notation will be prominently displayed, the lessons can be looped, the tempo can be adjusted to suit your ability, you can even change the key signature to learn each lesson in all 12 keys! What could be better than having your own "on-call" music teacher to explain and demonstrate the lessons. These are the ear-catching piano riffs that capture a musical mood or image with unforgettable style. They come in all genres - Ragtime, Classical, Boogie Woogie, Rock 'n' Roll, Jazz, Country, and Pop. Once you see them playing in Band-in-a-Box® and view the notation, you'll be surprised at how easy it is to add some "razzle-dazzle" to your own piano playing. RealBrushes are live audio styles that replace a MIDI drum track with actual recordings of top studio Jazz/Bossa/Rock/Country drummers playing brushes! These are not looped samples; they are full recordings, lasting from 1 to 8 bars, playing along in perfect sync with the other Band-in-a-Box® or RealBand tracks. This adds an exciting human element to your Band-in-a-Box® and RealBand arrangements, but that's just the beginning. 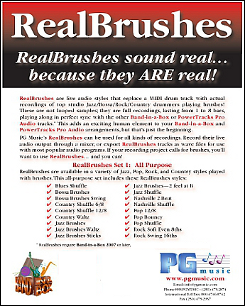 PG Music's RealBrushes can be used for all kinds of recordings. Record their live audio output through a mixer, or export RealBrushes tracks as wave files for use with most popular audio programs. If your recording project calls for brushes, you'll want to use RealBrushes… and you can!